NATHAN Sykes had his most romantic gig yet when a couple got engaged during his rendition of Over and Over Again. The former Wanted singer is currently supporting Little Mix on tour and played Nottingham on Wednesday evening when the on stage proposal took place. Nathan, had been serenading audience member Deborah when her partner Lee arrived on stage mid song and told the audience the song was their favourite. He then went down on bended knee and asked Deborah to marry him, producing a ring box from his hand. As Deborah said 'yes' the audience screamed in delight. 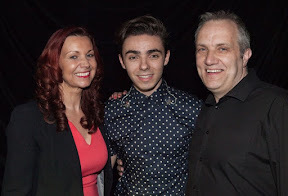 Deborah's daughter later Tweeted: "Congratulations to my Mum and her partner Lee, who've just got engaged on stage while @NathanSykes sang his song💍💕"
Fans cried calling it the 'cutest moment ever' and Nathan was beaming as he then posed for a picture with the happy couple. He later said: "She said yes!! Most amazing moment tonight during #OverAndOverAgain at @LittleMix #GetWeirdTourNottingham!!"